Is the Monday Night Football Furor Fueling Bad Sportsmanship? I, along with several million other football fans, watched in disbelief on Monday night as the Seattle Seahawks were awarded a game-winning, last-second touchdown after Golden Tate clearly pushed the Green Pay Packers’ defender in the end zone. The replacement refs (filling in for the regular NFL refs, who are being locked out) made no call on that, disagreed with each other whether it was a touchback or a touchdown, and have had everyone from first-graders on the playground to the President of the United States in an uproar since then! Blaming the refs for a loss or a “blown call” is already so prevalent in youth sports, I fear that this episode will only reinforce that behavior in young players and their parents. And make it so much harder for hard-working referees and umpires (my son included) in any sport to get the respect they deserve—if they even decide to get out on the field after this. How many times have you been to a soccer game where you think the ref missed a foul? Or an offside call? What about a baseball game where you think the plate umpire’s strike zone is too big? Or too small? Or maybe the base umpire called a runner out when he should have been safe. Do you yell at and berate the ref or umpire? Not if you’re a good sports parent, you don’t. You recognize that these decisions are being made to the best of their ability, in a split second of time, and you tell your child the same. You tell your child to be a good sport. I spoke with a handful of youth baseball umpires and youth soccer referees yesterday and they are worried about an increase in arguments over calls by parents and players due to all the airtime given to Monday night’s situation. One said he had already requested not to be assigned a game this weekend because of it. That made me sad. Now we might have a group of young soccer players who may not be able to play their game this weekend because of a lack of referees. I was heartened to read a Facebook post this AM by Mike Lopez, Sr., the retired football coach at Aloha High School in Oregon (my alma mater), in which he says, “all this continued criticism on both sides of the issue make it difficult to teach children COMPLIANCE to the rules for better sportsmanship.” He gets it. This is a man who coached at the highest level of high school competition for 47 years! 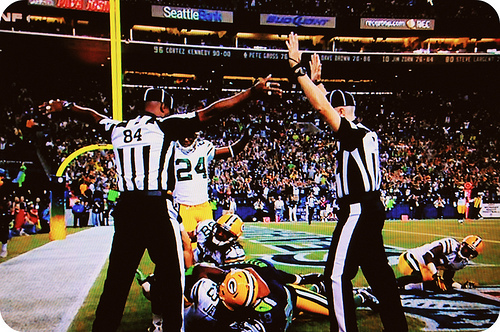 So, parents, the next time your child starts criticizing the NFL replacement refs, think twice. Is blaming them for the outcome of the game really the lesson you want your child to learn–and then emulate at their next game? Or do you want to be a positive role model and teach your child about good sportsmanship? I know which lesson I want MY children to learn.